After the ceremonial opening of the U.S. Embassy in Havana on August 14, 2015, Cuba and the U.S. held closed-door discussions. 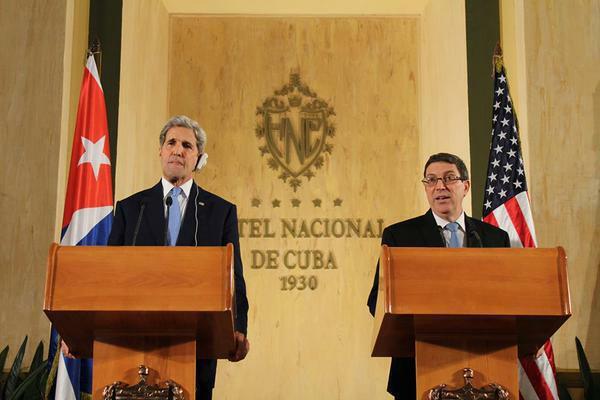 Here is what was disclosed about those discussions at a joint press conference at the city’s Hotel Nacional by Secretary of State John Kerry and Cuban Foreign Minister Bruno Rodriquez and from other sources. Guarded Optimism. Repeating his earlier remarks at the Embassy, Kerry said this was an historic moment as the two countries continued to engage in a cooperative way to address the many issues that had accumulated over the last 50 years. Rodriguez said essentially the same thing. U.S. Embargo (Blockade) Issues. Rodriguez re-emphasized Cuba’s demands for the U.S. to end its embargo (blockade) of the island and for the U.S. to pay compensation for the alleged damages to the Cuban economy caused by that measure. Kerry agreed on the need to end the embargo and emphasized President Obama’s request for Congress to do just that. This point was reiterated later that day by Cuban diplomat, Josefina Vidal, who said that Cuba is willing to discuss the 5,913 claims from Americans whose properties were nationalized after the 1959 revolution that brought Fidel Castro to power. A Cuban law, however, links negotiations on property claims to Cuba’s own claims for damages caused by the embargo and other U.S. aggressions. Steering Committee. The two countries have established a steering committee or commission to address the many outstanding issues. This body will meet in Havana for the first time in the first or second week of September. This body will follow three tracks. The first will encompass areas in which rapid progress is expected, such as cooperation on naval matters, climate change and the environment. The second will tackle more complex topics like the establishment of direct airline flights and U.S. telecommunications deals with Cuba. The last will take on the toughest problems, including the embargo, human rights and each country’s desire to have fugitives returned by the other. The third tier of issues (the most difficult) apparently will include ending the U.S. embargo (blockade), which is an issue for the U.S. Congress, not for negotiations with Cuba; U.S. compensation to Cuba for alleged damages to its economy from the embargo (blockade); Cuba’s compensation to U.S. interests for expropriation of their property in Cuba; the future status of Guantanamo Bay; and extradition of fugitives from one country to the other. I agree that the most difficult set of issues to be resolved by bilateral negotiations are those just mentioned. Indeed, as an outsider, I think they will be impossible to resolve by such negotiations. On the other hand, I think that the way to resolve these issues is direct and simple in concept: submit these disputes to an impartial third party. There are various ways this could be done. I have suggested that the Permanent Court of Arbitration at The Hague in the Netherlands be chosen by the two countries to resolve these disputes: it has been in existence since the late 19th century and has an existing set of rules for such proceedings, which will be lengthy and complicated. State Dep’t, Press Availability With Cuban Foreign Minister Bruno Eduardo Rodriguez Parrilla (Aug. 14, 2015); Reuters, Kerry Says Next U.S. President Likely to Uphold New Cuba Policy, N.Y. Times (Aug. 14, 2015); Reuters, Cuba Says Won’t Move ‘One Millimeter’ to Placate Enemies in U.S., N.Y. Times (Aug. 14, 2015); Assoc. Press, A Festive Flag-Raising, Then Tough Talk on US-Cuba Relations, N.Y. Times (Aug. 15, 2015);Reuters, Cuba’s Top Diplomat for U.S. Sees Long Road for Normal Ties, N.Y. Times (Aug. 16, 2015); Cuban Foreign Minister receives John Kerry (+Photos), Granma (Aug. 14, 2015); John Kerry: We are determined to move forward, Granma (Aug. 14, 2015); Cuba and U.S. discuss next steps in developing relations, Granma (Aug. 14, 2015); Cuba and the United States: Some questions about the future, Granma (Aug. 14, 2015); In joint press conference Bruno Rodriguez Parrilla and John Kerry, Granma (Aug. 15, 2015). One of the criticized U.S. immigration policies is the dry foot/wet foot program whereby a Cuban who lands on U.S. land is eligible for special U.S. immigration status while one apprehended at sea is not.. Another is the U.S.’ Cuban medical personnel parole program. Schwartz, Nicas & Lee, Obama Administration Pushes for Deal to Start Flights to Cuba by Year’s End, W.S.J. (Aug. 17, 2015); Reuters, White House, Cuba Work to Resume Scheduled Commercial Flights, WSJ, N.Y. times (Aug. 17, 2015). Previous posts have discussed Cuba’s claim for damages from the embargo (blockade); the U.S. claims for compensation for expropriated property; the Cuban lease of Guantanamo Bay to the U.S. and whether Cuba has a legal right to terminate the lease; extradition of fugitives. Reuters, No Timing for Resuming Commercial Travel to Cuba: U.S., N.Y. Times (Aug. 18, 2015), http://www.nytimes.com/reuters/2015/08/18/world/americas/18reuters-cuba-usa-airlines.html?_r=0. On August 20, a U.S. Department of State spokesman emphasized that the U.S. Cuban medical professional parole plan is operated by the U.S. Citizenship and Immigration Service, which is part of the Department of Homeland Security, but that there were no plans to eliminate the program at this time. It is not affected by the U.S.-Cuba rapprochement.